It is believed that one of the worst possible sensations of pain that one can be afflicted by are toothaches. They can be severe enough to get your head and ears throbbing along with the excruciating toothache and set you completely off gear. 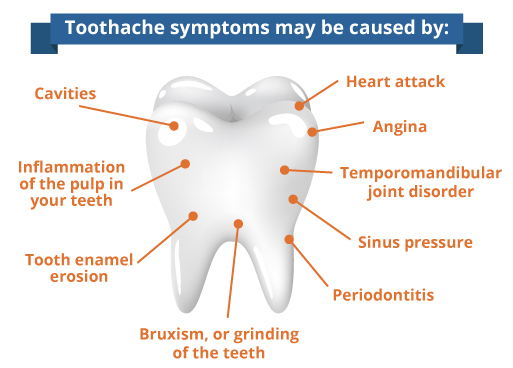 Toothache symptoms are various but more common than most is when toothaches cause headaches. This pain is usually associated with an infection in the oral cavity and is the more difficult to tolerate at night. Severe tooth pain can decrease focus at school or on the job and the nerve tingling may make you nauseous. Nausea causes loss of appetite or the desire to drink anything cold or warm. They can be miserable to say the least. It is always advisable to see a dentist even if there’s only tingling or light pain in or around the teeth. Sometimes the problem may be too deep-rooted to understand and may be in need of x-rays or a deeper analysis of the problem. Toothaches associated with each problem is different and can be at different levels. If one has cracked or chipped teeth the pressure can cause pain. On the other hand, pain caused by cavities can be very painful as it may have reached the nerve endings of the teeth. Until one gets to the dentist, one can take small steps that are simple yet assured to give some relief until you can see the dentist. Rinse your mouth properly and floss well in order to remove food particles from the crevices of the teeth. This often gives some relief. Hold a couple of cloves where it hurts the most. The clove softens up and the oil so secreted from the spice will seep in relieve you of the pain and provides temporary relieve with its medicinal qualities. Purchase over the counter pain relief gel and apply according to the directions. Rinse your mouth at regular intervals with a concoction of Epsom salt or regular salt and warm water. The warm salt water concoction will help disinfect the area and helps to reduce inflammation. The pain subsides temporarily and provides comfort. In terms of medication, aspirin or ibuprofen can help reduce inflammation as well. It is also believed that a mix of 500 milligrams of calcium and 200 to 300 milligrams of magnesium will help provide relief immediately before you can run to the dentist. One can also resort to herbal means for relief. Warm Chamomile or Echinacea tea will help provide relief from the pain. The tea also soothes the nerves and relaxes you physically. Once you have been able to control the pain temporarily, seek an appointment with a dentist to get the necessary medications or procedures done for permanent relief. And always call an emergency dentist is if it after hours or the weekend, especially if you are feeling sick to your stomach or can’t eat or drink due to the pain. Something more serious is probably going to be needed in these situations. Advice from Our Dentist in Monroe It is believed that one of the worst possible sensations of pain that one can be afflicted by are toothaches. They can be severe enough to get your head and ears throbbing along with the excruciating toothache and set you completely off gear.